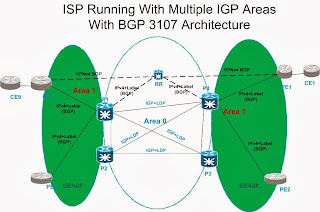 BGP Label Update: Carrier Support Carrier - RFC 3107 post was describing how BGP RFC 3107 help service provider to share the VPN routes across the boundaries without sharing the PE routes. BGP Label Update feature is mainly used during inter-AS communication so that the changes occurring in one network couldn't impact the other. Now consider in case of LTE network, there are thousand of thousand of eNODEB with all IP connectivity. Telecom provider is using IGP+LDP within the single domain. In this case, all the routes of eNODEB will flood across the domain however which is not required. Even we can't perform the summarization on loopbacks to reduce the number of routes within single area. How the scalability of PE will work in this kind of network? 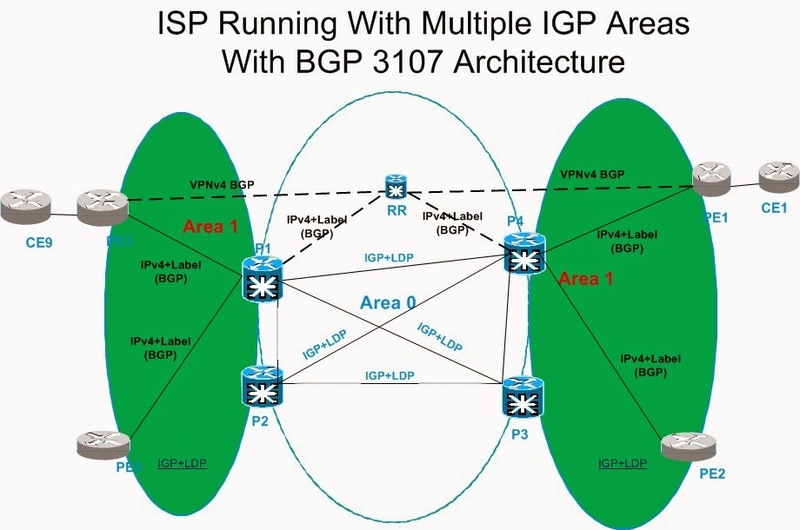 Probably, BGP-3107 based architecture can be utilized within single Service Provider domain also to carry PE reachability. BGP IPv4-label address-family sessions between PE and P routers. IGP+LDP still runs within areas but does not carry PE reachability across areas. Remote PE loopback is a BGP ipv4 labeled route in RIB and next-hop for BGP service prefix is a BGP 3107 route. BGP Label Update allows you to set up a Virtual Private Network (VPN) network so that the autonomous system boundary routers (ASBRs) exchange IPv4 routes with Multiprotocol Label Switching (MPLS) labels of the provider edge (PE) routers. In this scenario, Route reflectors (RRs) exchange VPNv4 routes and ASBR get relaxed to store those routes. This results in improved scalability and simplifies the configuration. By using this feature, you can use non MPLS network as transit network, this helps you to transport all the IPv4 routes with labels over non MPLS network. In the above scenario, route reflector can reflect the IPv4 routes and MPLS labels learned from the ASBR to the PE routers in the VPN. This is accomplished by enabling the ASBR to exchange IPv4 routes and MPLS labels with the route reflector. The route reflector also reflects the VPNv4 routes to the PE routers in the VPN. ASBRs exchange IPv4 routes and MPLS labels for the PE routers by using EBGP. Out of four, Update Messages contains the Network Layer Reachability Information (NLRI), which has IP addresses of the usable routes. The update message also includes path attributes and the lengths of both the usable and unusable paths. Labels for VPNv4 routes are encoded in the update message as specified in RFC 2858. The labels for the IPv4 routes are encoded in the update message as specified in RFC 3107. In my previous post of Segment Routing: Alternate of LDP and RSVP, already discussed about the advantages of using SR w.r.t LDP. The utmost advantage of using Segment Routing is to steer the traffic which is normally called “Traffic Engineering”. In case of MPLS we called Traffic Engineering as MPLS-TE but in case of Segment Routing, it could be SR-TE (Segment Routing Traffic Engineering Tunnel. RSVP is required to build the MPLS-TE tunnels along with LDP but in Segment Routing, all you need is the Segment IDs only. It is free from heavy RSVP signaling. 1. Manually Create SR-TE tunnel and explicitly define the path. This is equivalent to MPLS-TE tunnel and define explicitly path by giving the next hop addresses.